Hazlitt Creek is in the communities of Highlands, one of thirteen communities in the Capital Regional District of British Columbia. 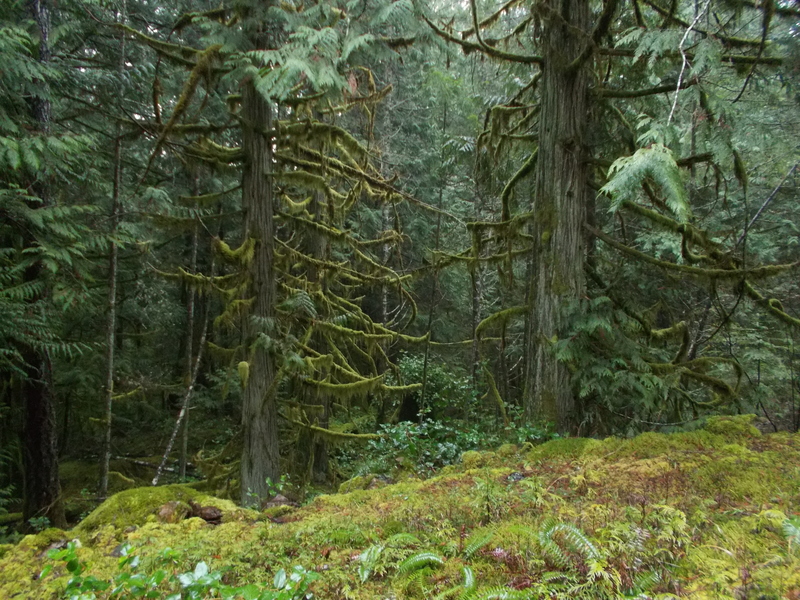 With a creek flowing through the ravine and a splendid hilltop wildflower meadow covered with moss, Garry Oak and Arbutus trees, Hazlitt Creek Park is a wonderful small nature park. Hazlitt Creek flows though the ravine and has some rough trails that provide access to the water. 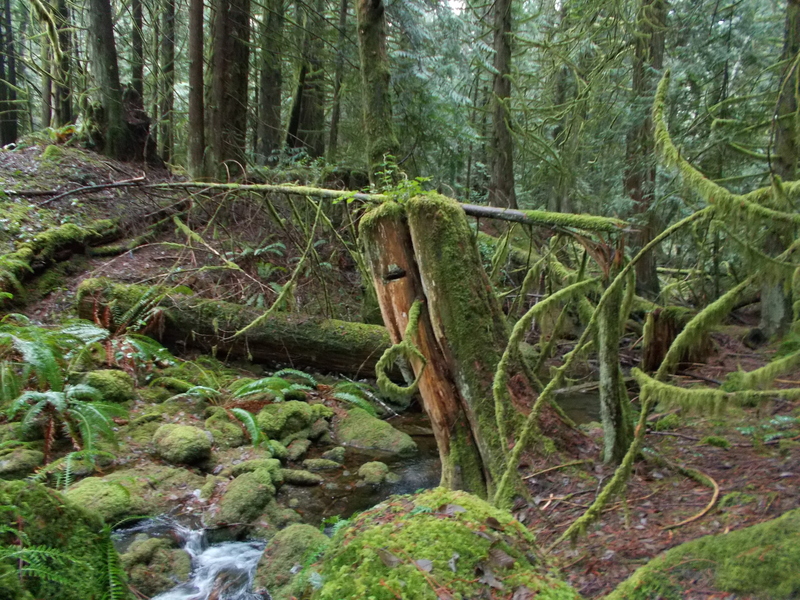 The forest itself is littered with old stumps, many showing the notches made for a logger’s spring board. As you walk along the wide easement trail enjoy the beds of ferns, seasonal wildflowers, as well as the moss that covers pretty much everything. Eventually this easement roadway leads to private property so look for the signpost for the hiking trail up to the hilltop meadow. Hazlitt Creek Park can be reached from the Trans Canada Highway Hwy1. Exit onto the Millstream Road and follow along to reach Mill Stream Lake Road. Turn right onto Millstream Lake Road. Once on Millstream Lake Road turn left onto Old Mossy Road. Alternatively access the park from the Mckenzie Street exit and follow to the Pat Bay Highway to the Royal Oak Exit that leads to West Saanich Road. Follow West Saanich Road to the junction with Wallace Drive. Once on Wallace Drive turn left onto Willis Point Road. Follow Willis Point Road to reach the Ross-Durrance Road. This road meanders through the Highlands so proceed with caution then turn right onto Old Mossy Road. Near junction with Old Mossy Road and Hazlitt Creek Road, the park can be accessed near the yellow gate, seen on the left side of Hazlitt Creek Road. The park runs the length of Hazlitt Creek Road which has a road side trail. There is very limited parking near this part of the park. You can also get to Hazlitt Creek Park from the end of Millstream Road. Look for the road side trail marker for the trailhead. You can get to Millstream Road from the TransCanada Highway. Take the Millstream exit and stay on Millstream Road until it reaches its final meander and ends, high in the Highlands. Again there is very little road side parking. Either way Hazlitt Creek Park is well out of the way to find and visit.